Product Type: Framed Art Print. Title: The Son of Man. 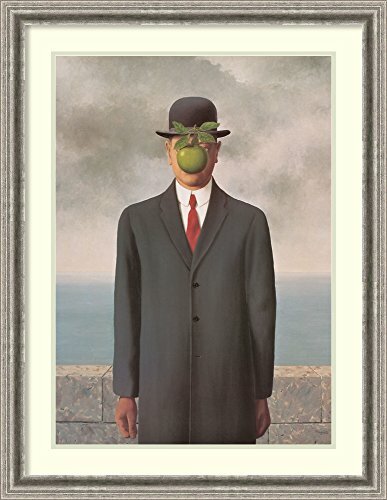 Artist: Rene Magritte. Subject: cuisine, people, person, coat. Frame: Bel Volto Silver Pewter Scoop 1 3/4" Wood. Mat: White/silver mist grey. Image Dimensions: 19.5" x 27.25". Outer Size: 27.38" x 35.13". This Amanti Art Decorative Framed Art Piece is a home decor item you can be proud to showcase on your wall. Our craftsmen hand made this piece in a small custom art and frame shop in America's heartland. We know that each decoration you choose for your home, be it for your living room, foyer, kitchen, bedroom, bathroom or other space, is a reflection of your style and taste. This image comes framed in a variety of colors and sizes that you can select. Choose from casual, traditional, modern, contemporary, country rustic or shabby chic styles. All pieces have durable wires already affixed to the back for easy hanging and installation. We hope you're pleased with your Amanti Art purchase! Outer Size: 27.38x35.13", Image Size: 19.5x27.25"
Frame: Bel Volto Silver Pewter Scoop 1 3/4" Wood. Mat: White/silver mist grey. Art is finished with gallery-quality acrylic glazing, fade resistant inks, and is dry-mounted to prevent rippling. Framed art is made using solid wood moulding. Finished art piece is professionally handcrafted in Madison, Wisconsin. Ready to hang for easy installation. This item will be custom built for you. Please allow 10 business days for custom framing. If you have any questions about this product by Amanti Art, contact us by completing and submitting the form below. If you are looking for a specif part number, please include it with your message. Rivet Abstract Brushed Blue and Yellow Canvas Print, 36" x 24"
Julia Purinton Premium Thick-Wrap Canvas Wall Art Print entitled An Evening Out Neutral 48"x32"